This has been on my “To Read” Goodreads shelf almost as long as The Winds of Winter, but the good news is that this one has a light at the end of the tunnel, and that tunnel ends next month, people! !​ By the end of July, we should all be so lucky as to own a copy of Victor Milan’s The Dinosaur Lords, which sounds to me like a colossal combination of so many of my favorite things. Check it out on Goodreads.com for the full synopsis, but it pretty much had me at, “dynastic rivalries, religious wars, and byzantine politics… except the weapons of choice are dinosaurs.” It sounds as though it will have the political and martial intrigue of the A Song of Ice and Fire Series, with the unknown, threatening power of Jurassic Park, and do I detect a hint of the omnipotent control of Greek mythology? Dare I hope? I’m still reeling from my immersion in all things Jurassic Park lately, so I think this will be a welcome revisit to the exciting subject matter while still promising an entirely new experience. And this cover art. I mean, please. Anyway, I’m looking forward to this newcomer and I’d love to hear what you all think. Would you read it? What books have you counting down the days? Did anyone get my 38 Special reference? Let me know! I feel… unresolved, having just completed Ian Tregillis’s The Mechanical. I was promised a story about a race of servant robots, or “Mechanicals,” that cater to humans oblivious of their servants’ seemingly unobtainable but feverish desire for Free Will. A Dutch monarch has invaded France and exiled the French people and their King to what I assume is current day America. Mechanicals are treated by humans as merely helpful but unthinking possessions; however, they have minds and thoughts of rebellion. Any sympathizing or attempts to free Mechanicals from servitude is punishable by death, as freedom of their working class would remove all power from the Dutch empire. That is what I was promised and that is what I received. And yet, having completed the novel, I can’t help but feel so utterly… incomplete. I’d imagine this is what it’s like to get dumped after what you thought was a perfect date; I do not understand what has just transpired and I’m gonna need some closure, here! I just listened to Tregillis prattle on for over 400 pages only to be left with zero resolution and all of my characters in a state of perilous limbo. And maybe that’s my problem: in terms of a compelling and complete stand-alone novel, The Mechanical is utterly insufficient. I understand that this book was written with the intent of being the first in a series, and more power to Tregillis. I do love a series. But I’m of a mind that any individual work should be able to be separated from the group and still offer the full development, climax, resolution that readers seek. By all means, leave a few plot lines dangling on the brink of mayhem; keep those readers coming back for more. But not every single one! Don’t toss every single main character into seemingly unavoidable peril in the last chapter and then hit me with the acknowledgements. Honestly, I’m just surprised by the abrupt ending of this novel. I hate to continually compare a series to Harry Potter, LOTR, or SoIaF, but at least each of those volumes were left with an element of closure; Harry lives to see another year at Hogwarts, but Voldy is still alive; Frodo and Sam are plugging along towards Mordor, but that will be dangerous without the rest of the company; Little Finger just went nuts on Lysa Arryn, but that probably bodes well for Sansa. A good mid-series volume ties up a few ends but holds a string of potential trouble and a few dangling story lines which ensure you’ll be back. The Mechanical offered a hailstorm of misery, then “The End.” I’m not sure whether I’ll continue the series in the future; I guess I’ll let myself decide when the time comes. What does everyone else think? Should a volume in a series be able to stand alone or should they be so heavily connected that one is incomplete without the others? I’d love to know what everyone thinks. I’m not giving up on Tregillis; although the story itself was frustrating, the writing and story-telling was wonderful, and I’ve heard good things about his other novel, Bitter Seeds, so that is my next endeavor. Stay tuned! I’ve decided to review this book by creating a new “If you like this, you might also like this” segment. A lot of my reading choices are based on comparisons to other things I’ve liked (thank you, Goodreads; find me at lindsayjohnna! ), so I’m hoping to find a few similarities along my reading road that might offer some helpful insight! Let me know what you think. The first one is a little obvious, but this past Christmas, Brice got me The World of Ice & Fire by George R. R. Martin, Elio M. Garcia, Jr., and Linda Antonsson since he’s aware of my love for Martin’s magnificent series and also for tracing literary lineages. Martin worked closely with the other authors to ensure that the book read as a history, much like J. R. R. Tolkien’s The Silmarillion (another reason I simply adore it). He also worked with the artists to ensure that the book’s illustrations captured his mind’s image of his imaginary world, and thank God for that because these pictures are above and beyond the reach of TV. I’m the kind of reader who loves to know back story; throughout the series, we come to understand how the realm came to be a unified kingdom, but The World of Ice & Fire elaborates on the migration of the Targaryens to Westeros, the conquering of the kingdoms, the reigns of many Targaryen kings, Robert’s Rebellion, the many houses and realms in Westeros and Essos, etc. I loved reading this and I go back frequently to check my facts & review the mesmerizing illustrations on every page. Truly, I cannot praise the artwork enough. I highly recommend this book for anyone who loves the series of novels and wants to know more than can be contained in the already very long books. Filed under Book Review, Lindsay, Love This? Try This! Well, I too finished reading A Dance With Dragons. Being a lifelong Harry Potter superfan, I never thought I would pick up on another series the way I did with little Harry. This was my second time reading the series, and I will admit, I enjoyed it much more the second time through, specifically book 4, A Feast for Crows. George RR Martin has managed to create a massive world filled with characters, languages, and rich history that all readers can enjoy, then live and breathe. Every character is so real, and sadly, some of the most honorable and like-able characters die because of their will to do the right thing. Sometimes I would find myself rooting for the “bad guys” because just like in life, no one is all good and all bad, but instead, a bit of both. Picking sides is frightening, because the characters are disposable, just like we are in “real” life. As to where I stand and what I desire for Westeros, I will say this: Winter is Coming. In truth, I could write pages and pages of reviews for each book. Reading this series has reminded me why I love reading: getting lost in the Riverlands, being chilled to the bone on the wall, tasting the sweet Dornish wine, sweating with Dany in the Free Cities, feeling the wind from the Moon Door, and best of all, watching the writing jump from the pages to television with HBO’s Game of Thrones. “The best fantasy is written in the language of dreams. It is alive as dreams are alive, more real than real … for a moment at least … that long magic moment before we wake. Because I love images, here is a beautiful one of each major house sigil. And now, we are onto The Great Gatsby! If you would like to read along with us, we are setting our first goal of finishing 81 pages (the end of chapter 4, for those of you, like me, reading on eReaders) by Friday. That is tomorrow, which means I need to get to reading! For every book we read, I want to do something super fun and unique (blog flair! ), so I decided on a fabulous section called Read This, Drink That! 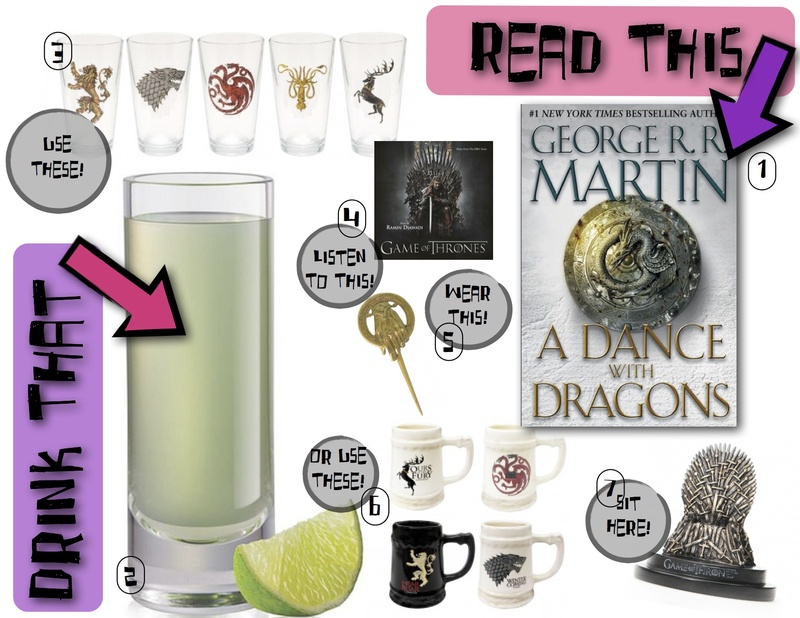 Even more fun, I have made this diagram of everything you could possibly need while reading GRRM’s Dance with Dragons. I have done this because I am awesome. I was a wee bit inspired from Fashionably Bombed‘s Drink This, Wear That posts. Side note: obsessed with their blog. Anyway, this cocktail is a delicious-looking Green Dragon. It uses Skyy Dragon Fruit Vodka and apple liqueur. How reminiscent of Rhaegal! Dany should raise a glass and toast (HAHA! PUN!) her dragons with one of these delicious concoctions. Hope you enjoy (the diagram and the cocktail, that is)! PS: If anyone actually sees this post and then decides to buy the Iron Throne (replica), I expect an invitation and photo shoot as a thank you gift. While I am finishing up Dance with Dragons, I thought I would post this extremely awesome (and helpful) map I have been using to guide my travels through Westeros. Not only is every castle ever mentioned in the series included, but the creator, Other-In-Law, has also included the castles and sigils mentioned directly from GRRM’s mouth in interviews found on Westeros.org. Check out Littlefinger in The Fingers and Tyrion down in Casterly Rock! Even Rhaegar with his harp sailing from King’s Landing! I could literally stare at this thing all day. And sometimes I do.